Mustard seed grows wild throughout much of the Middle East and Africa. Mustard, a member of the Brassica family of plants, bears tiny round edible seeds and tasty leaves. The seeds aren’t flavorful until they are cracked, after which they are mixed with a liquid to become prepared mustard. Mustard is a versatile cruciferous vegetable which belongs to the same family as broccoli and cabbage. Tiny little mustard seeds are used in cuisines all around the world, flavoring curries, soups and pickles. This easy-to-find spice comes in two forms, whole seeds or ground, and forms the basis for countless varieties of the condiment we know as prepared mustard. Mustard is one of those condiments that just seems to improve everything it touches. 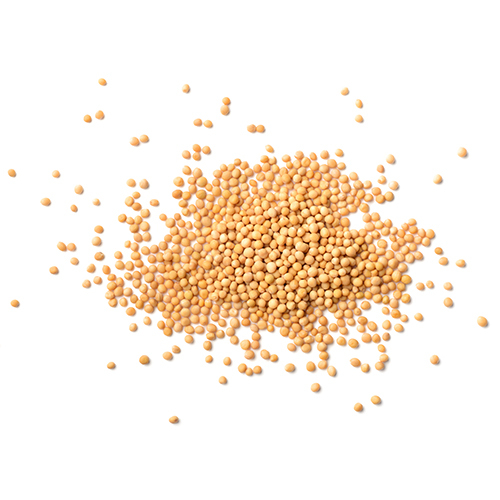 Yellow mustard seeds are the primary ingredient in American mustards and are also used in pickling spice mixes. Brown mustard seeds are commonly used for pickling and flavoring meats like corned beef. Many European mustards are made with brown mustard, and is also used a lot in Indian cooking. Ground mustard is also called powdered mustard, mustard powder or mustard flour. It is commonly used in spice rubs, salad dressings, soups, and to add an acidic component to cut through rich sauces like for macaroni and cheese. Plant the mustard seed about three weeks before your last frost date. As the mustard flower grows and matures, it will form pods. A sign that you are nearing harvest time will be that the leaves of the plant will start to yellow. Once that happens you can remove the seeds from the pods.